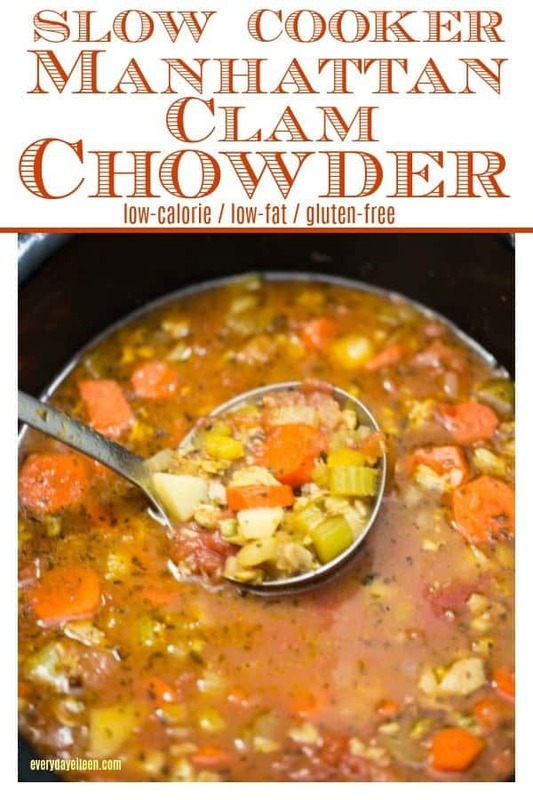 Slow Cooker Manhattan Clam Chowder is a homemade soup that is super easy to prepare. 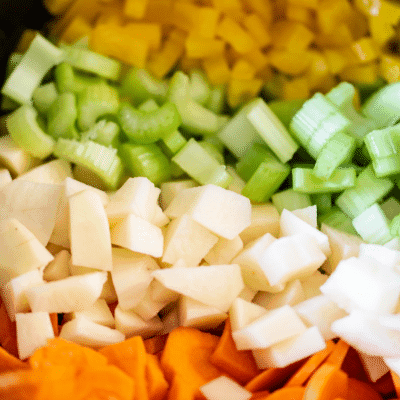 It will take just a few minutes to chop your veggies and the slow cooker does the rest! Have you enjoyed Manhattan Clam Chowder in restaurants? This recipe blows them away with hearty flavors from the veggies and clams! This zesty soup is naturally gluten-free, low-fat, low-calorie, paleo, and vegetarian-friendly (leave out the bacon). 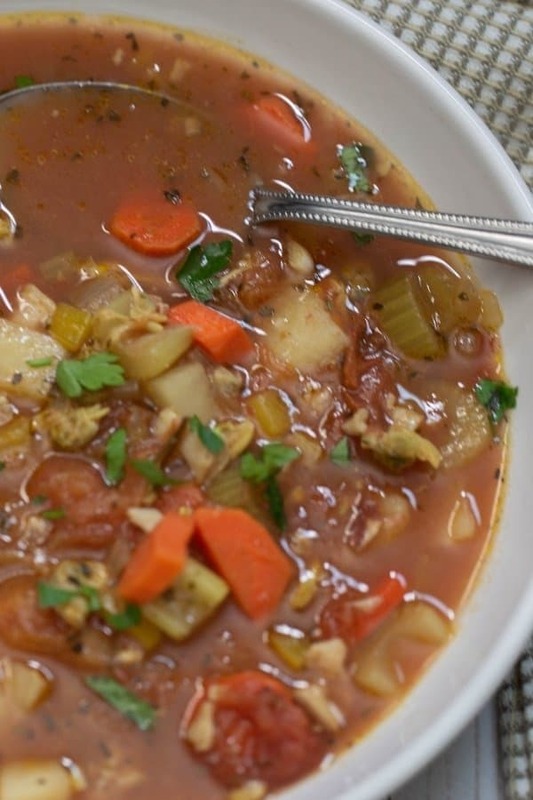 This Manhattan Clam Chowder recipe is one I have been making for years! Living on Long Island I have had the pleasure of many a great bowl of clam chowder. Long Island always has a “best chowder recipe contest”, my family loves going to these events because we are chowder fans. I am quite proud of this chowder because it is not only easy to prepare but absolutely delicious and I may say the family says it is contest worthy! Trust me, make this easy slow cooker Manhattan Clam Chowder and you will never want any store made or canned soup again! We are in a really cold spell in New York and soup is on my families mind every day. We enjoy Manhattan Clam Chowder a few times a month. Actually, we eat this all year. Does anyone else enjoy hot soups in the summer as we do? Gazpacho is a favorite of ours in the summer but we do enjoy a good chowder all year long! My favorite is this Manhattan Clam Chowder. I love that it is so easy to prepare but I am very proud of the flavors of this soup. Surprisingly, I use canned clams because they are so easy to work with. I have made clam chowder using fresh clams and to be honest, this chowder is just as tasty and delicious. Without the need to strain out the clam broth a few times. This clam chowder is easy peasy. What is the difference between Manhattan Clam Chowder and New England Clam Chowder? Manhattan clam chowder is a tomato based chowder. New England clam chowder is a creamy base, usually heavy cream or milk is the base. Where are the origins of Manhattan Clam Chowder? Guess what? Manhattan Clam Chowder did not originate in Manhattan. It seems the chowder originated in Rhode Island from Portuguese immigrants. I found this out a few years ago. Food origins can be very fascinating. Can Manhattan Clam Chowder be frozen? Absolutely. 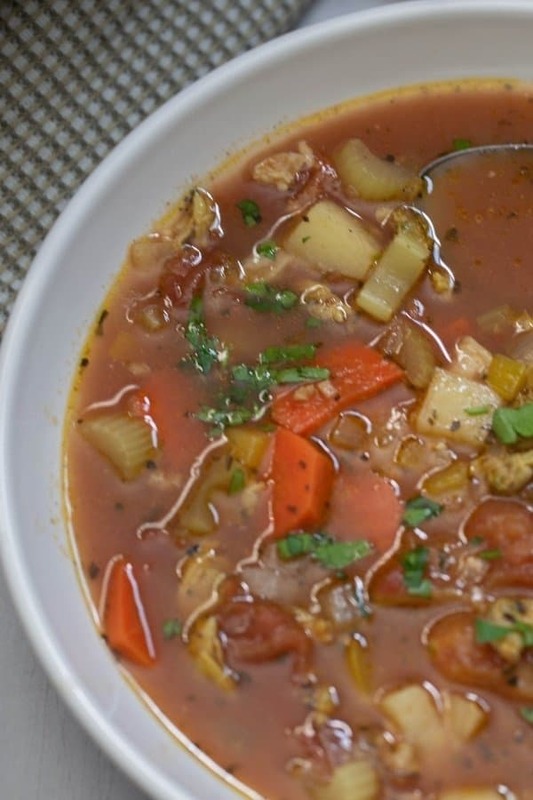 This Manhattan Clam Chowder Recipe freezes well because there is no dairy. Freeze in either freezer safe tins, freezer bags, or use a Food Saver, my favorite option. Is Manhattan Clam Chowder Keto? Authentic clam chowder includes diced potatoes which are not Keto. If you want to make this a Keto Manhattan Clam Chowder simply keep out the potatoes and I would add turnip and radish. Also, add extra carrots. Can the bacon be left out of this recipe? Absolutely. 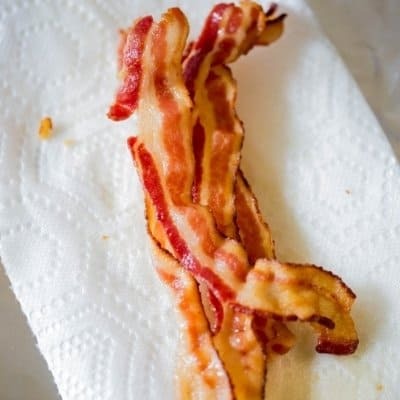 If you do not eat bacon or don’t want to include bacon, leave it out of the recipe. How long can Slow Cooker Manhattan Clam Chowder keep after it is made? This soup, like most, tends to get more flavorful overnight. I love to make this a day ahead. The soup keeps in the fridge for 2-3 days. Otherwise, freeze the soup for a future day. Can this soup be made on the stovetop? Sure, I will include the instructions in the recipe. Butternut Squash and Sweet Potato Soup: This is one hearty Vegan soup that the hubs doesn’t even realize is vegan. Low-fat Potato Leek Soup: Been making this soup since I was about 12, a personal favorite. Another vegan favorite but the hubs and kids top with sour cream. Carrot Coconut Soup: Who knew, we love Vegan soups. My friends, this soup is delicious! Today is National Soup Swap Day and the lovely Katie who runs Katies Recipe Box is hosting this fantastic day! Below my recipe is all of the recipes for today! I hope you check out all the recipes, they are full of comfort and tasty! 8-Quart Crock Pot: I recently purchased this slow cooker. I love it. The heat is perfect and the food cooks perfectly. In a skillet, over medium heat cook 4 slices of bacon. Remove bacon, set aside. Then discard all but 2 Tablespoons bacon grease. Add to the skillet the onions to slightly brown. Add in garlic for another minute. Pour in the white wine and scrape up any brown bits at the bottom of the pan. Let cook another minute. Into the slow cooker, add in the white wine and onion mix, potatoes, peppers, celery, and carrots. Stir in clam juice, tomato paste, water, clam juice, and the diced tomatoes and its juices. After the allotted time, the veggies should be soft. Then add in the clams and recover and cook another 5 minutes. Add in the bacon and fresh parsley, if using. We love seeing and sharing your creations. When you make this or any of my recipes, I love seeing them. Tag me on Instagram with @everyday_eileen or #everydayeileen. I love any comments or questions, please leave below! 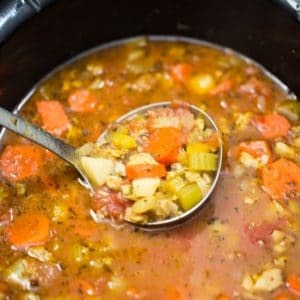 Love this Slow Cooker Manhattan Clam Chowder, I would very much appreciate it if you give it a 5-star rating and share any comments or questions below! An easy and delicious slow cooker Manhattan Clam Chowder made with canned clams. Once you make this recipe you will never want a canned soup again. The prep time is about 10 minutes and the slow cooker does the rest. A low-fat and delicious soup that can be a main meal or an appetizer. In a saute pan over medium heat, add the 4 slices of bacon. Cook until browned on both sides about 5 minutes. Remove bacon, cut into small pieces and set aside. Remove all but 1 Tablespoon of the bacon grease. Reserve a few Tablespoons of bacon grease in case you need it to saute veggies. Combine into the slow cooker the onion mixture, carrots, celery, potatoes, pepper, bay leaf, basil, oregano, parsley, and thyme. Season with salt and pepper. Cover with lid. Set timer for either 3-4 hours on high or low 6-8 hours. Add in the clams. Cover and cook 5 minutes on high. Shut off the slow cooker and add in the bacon pieces. Sprinkle with parsley for garnish. Check the seasoning and re-season if needed. In a large Soup Pot or Dutch oven, over medium heat, add the bacon. Cook until cooked through, remove bacon. Cut bacon into small pieces Set aside. Remove all but 1 Tablespoon of the bacon grease. Reserve a few Tablespoons of bacon grease in case you need it to saute veggies. Add the diced onions to the pan and saute about 3-4 minutes. Add the garlic and stir another minute. Add the white wine. Use a wooden spoon to scrape up any brown bits on the bottom of the saute pan. Stir in all the ingredients from step 3. Let simmer on low for about 30-40 minutes. Veggies should be soft. Add in the clams and continue to simmer for another 5 minutes. Add in bacon and parsley. Check the seasoning and re-season if necessary. Note 1: Center Cut Bacon is lean, my preferred bacon choice. Note 2: If not using bacon, omit and just add the onion, garlic, and wine to slow cooker. Note 3: I use red potatoes, Idaho or Yukon work well also. Note 4: Use your hands to smash the tomatoes into the slow cooker vessel. Note 5: Any color pepper is fine. Note 6: This is (4) - 6-ounce cans of minced clams. Add the juice to the slow cooker and refrigerate the minced clams until ready to add to the slow cooker. Note 7: If you do not use bacon, either saute onions in olive oil or just add the onions right to the slow cooker. I’m a huge fan of Manhattan clam chowder. Love that this is made in the slow cooker! Thank you Karen, this is a favorite of mine! Yum this looks amazing! A delicious and hearty soup, perfect for this cold weather! Thank you for sharing. I can’t wait to make this recipe for my mom. She loves manhatten clam chowder and will love this! Aw, I hope your Mom enjoys the Clam chowder. My Dad and Mom also love this soup. I am making them some tomorrow. This soup looks fantastic! My family absolutely loves seafood and I bet they would devour this! Thank you, Valentina, I hope they make the soup and enjoy! I was suprised to Jolene when I found out this soup originated in New England and I agree, it is good! This is a soup I’ve only ever eaten in restaurants! I don’t know why – I’m definitely giving this recipe a try soon! Oh Amy, this is such an easy recipe! Make it at home and enjoy! Excellent Karen! This is a great low calorie soup! I hope your family enjoys the soup as much as my family, Lisa! My husband loves clam chowder, but I’ve never made it for him. Now, I have no excuse with this recipe! Awesome Mackenize, this is a great chowder and I hope your husband enjoys the chowder. Um, hello!!! This is one soup I would never say no to!!! Excellent Colleen! I hope you enjoy the chowder. 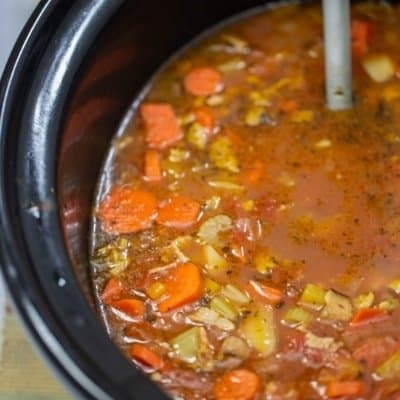 I’m always looking for more slow cooker soups! Thanks for celebrating National Soup Swap Day with us! Kate, you are a wonderful host! What a great group of recipes from some of my favorite bloggers today! I’ve been wanting a Manhattan Clam Chowder recipe. Thanks for sharing. I hope you enjoy the chowder recipe Wendy! I’m a fan of any kind of clam chowder. Yours sounds so good!